In the midst of writing a rave review of Alan Berger's fine tome Drosscape (look for it in the next week), a very brief post from Pruned with the cryptic text 'We ♥ P-REX' appeared, and sent me to the site of Berger's Project for Reclamation Excellence, which has a ton of great information... after a look, I'd say I 'heart' P-REX as well. "Systemic Design Can Change the World© ... Systemic Design implies that there are larger scale forces in the built and natural environment that, if properly understood, will lead to more intelligent project scenarios as opposed to superficial cosmetics. Systemic Design merges the existing stresses on a landscape with multi-layered, time-based strategies that work to reclaim value and increase sustainability in the built environment. Systemic Design seeks to interact with the environmental, economical, and programmatic stresses across regional territories. Understanding how natural and artificial systems dynamically function in regions and cities, and ultimately feedback from new design and planning interventions, forms the basis for smarter urban landscape projects in the future. Rapidly expanding technological and design mining tools enable new readings of landscape systems, and the invisible flows and forces that shape the tactile world. Professionals who are prepared to understand, use, and act on those readings will produce the next generation of strategic solutions to address the most pressing environmental and social challenges of our time, including: climate change, landscape toxicity, renewable energy, water process, deindustrialization, environmental justice, and adaptive reuse. We believe that innovation and discovery must be fostered through transdisciplinary inquiry and performance. Acting individually, professional fields are having marginal to no effect on urban sustainability. Conversely, Systemic design reorganizes disciplinary thought and process around one critical idea: innovation. 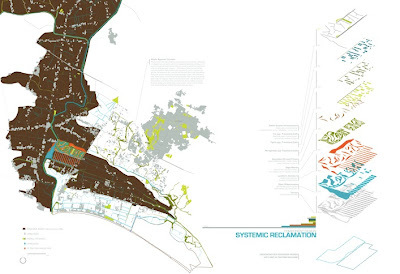 The goal: to plan and design more environmentally sustainable urbanism at all scales." 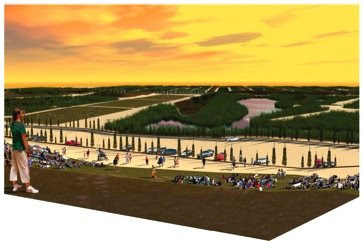 Some interesting projects (and graphics) include those associated with the Wellington-Oro Site Planning, in Breckinridge, Colorado, which: "...an overarching ecological strategy that integrates all 7 project areas into one functioning system combining remediation and recreational land uses. 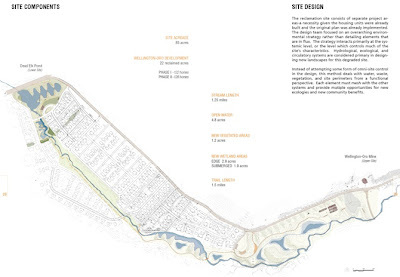 On a larger scale, hydrological, ecological, and circulatory systems for recreation run through the entire site and are woven through the concept plan’s 7 project areas. 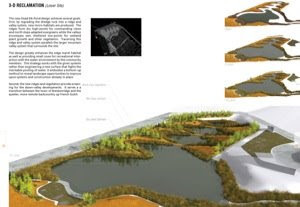 On a smaller scale, each project area consists of environmental and time-based ecological design strategies that incrementally build new habitat, vegetative communities, and biodiversity, while cleansing water and soil degraded from previous landscape activities." 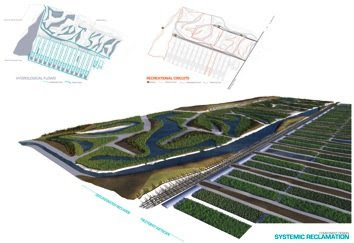 Another project I like is the Pontine Systemic Design, which is described as such: "The site strategy is to artificially re-introduce a gigantic new “wetland machine” for filtering, habitat, and biological exchange. ...The Wetland Machine’s dimensions are directly related to the amount of wetland area needed to treat the amount of water in the Canale Aque Alte—the major collector for this highly polluted zone. At 220 l/s, with a load around 50+ mg/l of N, at least 2 square kilometers of treatment wetland will be required. The design retro-fits and widens existing canals to serve as flow distributors. Furthermore, soil cut/fill operations are used for terraforming shallow ridges and valleys to hold/treat water and make raised areas for new public space and program." It's interesting graphically, and picks up on the sum total of Berger's work in reclamation, both in theory, competition and practice, found in many of his writings as well. One interesting aspect on the site was the concept of projects described with both the Landscape+Urbanism title, and abbreviated L+U... which seemed oddly familiar, no? Not sure the timeline of this usage versus my own, but hope to find out - any ideas?